I preserved some lemons this winter basically to make this recipe: Moroccan Chicken with Preserved Lemons and Olives (Djej Makalli) from the Daring Gourmet. My sister had been urging me for months and months to preserve lemons just so I could make this recipe. Finally, since basketball season is finally over (great job, girls, btw) and going to watch over baseball is not quite such a busy task, I decided to make this dish for dinner one weeknight. Let me tell you this dish is soooooo delicious! I wanted to find some other recipes that used preserve lemons and fit into our current eating habits. I found a great recipe at M.J.’s Kitchen. I modified it a bit, but this is M.J.’s creation. This is M.J.s Recipe verbatim. 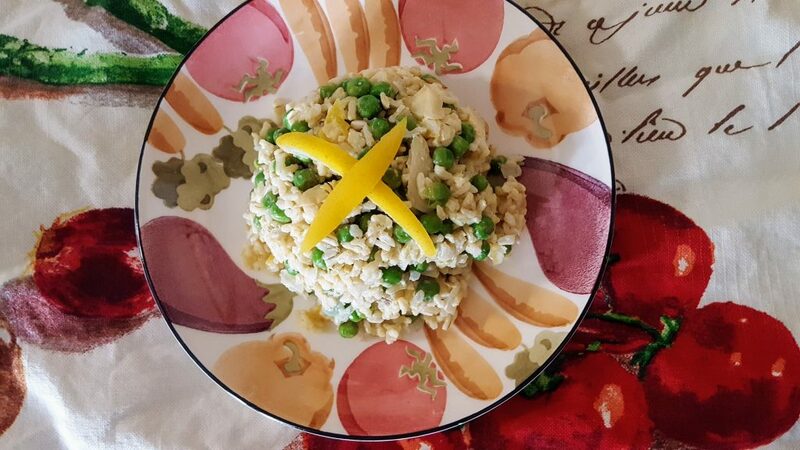 I just threw in some frozen peas, used brown rice and decreased the cheese a bit. Whisk the eggs with the preserved lemon and juice. 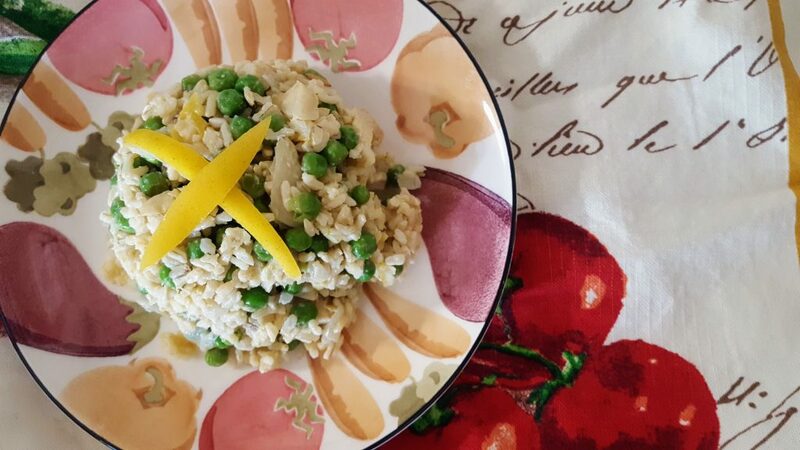 Fold egg/ lemon mixture, pepper, peas and artichoke hearts into rice. Remove from heat, cover and let sit 2 minutes for eggs to set. Gently fold in cheese. Let sit, covered, for another minute or two and then serve. *This first step can be done in your rice cooker as well. Rice cooked with stock instead of must have tasted particularly flavoursome. This dish is even better the next day. That’s a pretty dish! I happen to have some jarred artichokes and frozen peas. But I could nevertheless plate it’s lovely as you do. First of all THANKS so much for the shout out. It’s such a compliment to have someone redo a recipe. Now I need to make this recipe with brown rice and peas. What a beautiful and healthy version! Thanks again Debra! I love preserved lemons. I first used them in one of Dorie’s tuna salad recipes—so good. Then I couldn’t find them again locally. I used a quick recipe to make my own, but it just wasn’t the same. 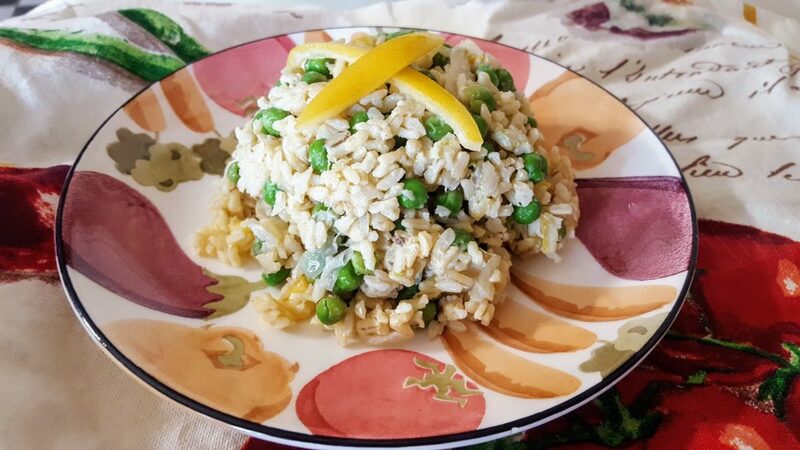 Your rice looks amazing! Well I am in love with this recipe. For one I love artichokes and preserved lemons give such a wonderful flavor. Thanks, Evelyne. And it only gets better the longer it sits (but there aren’t many leftovers).